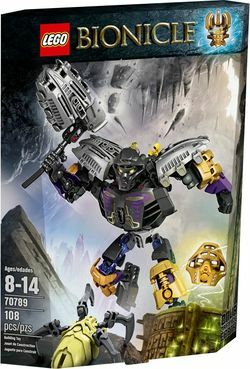 70789 Onua - Master of Earth is a BIONICLE set released in 2015. This is a description taken from LEGO.com. Please do not modify it. (visit this item's product page) Quarry underground with Onua’s earthquake hammer! Dig deep with Onua – Master of Earth to claim the mystical Golden Mask! This durable, highly posable figure with 4 golden BIONICLE® shells and bashing battle arm is fully geared up for underground combat against the Skull Spider. Burrow underground with the turbo shovelers while evading the evil Skull Spider’s efforts to pop off Onua’s mask. Then convert his turbo shovelers into a massive earthquake hammer, the only tool powerful enough to break through to the Golden Mask. Resist the Skull Spider’s attempts to pop off Onua’s mask! Combine with 70781 LEGO® BIONICLE® Protector of Earth using building instructions available at LEGO.com/BIONICLE to power up for ultra elemental battle! Facts about "70789 Onua - Master of Earth"
This page was last edited on 12 January 2016, at 21:22.